Read the WSDOT Blog about upcoming construction activity happening this spring on I-5 in Pierce County. Contractor crews building connecting HOV lanes between State Route 16 and Interstate 5 have re-opened South 38th Street to all traffic in Tacoma. Contractor crews working for the Washington State Department of Transportation worked through the overnight hours of April 20 to complete the work. As of 5 a.m. Sunday, April 21, southbound I-5 and eastbound SR 16 drivers exiting to South 38th Street can turn right or left at the top of the ramp. Traffic at the top of the ramp is now controlled by a temporary traffic signal. The southbound I-5 ramp to westbound South 38th Street is now closed for reconstruction. Travelers coming from I-705, SR 7 and Pacific Avenue are now shifted onto one lane across the new southbound I-5 bridge. From there, drivers now have the opportunity to exit to South 38th Street or continue to southbound I-5. WSDOT contractor Skanska has implemented a traffic shift for eastbound SR 16 travelers headed to southbound I-5. Drivers on eastbound SR 16 going to southbound I-5 need to merge left after Union Avenue to reach southbound I-5. From there, they will follow the signs to southbound I-5 and travel across newly built HOV lanes that have been temporarily striped as general purpose lanes. There is no change for eastbound SR 16 drivers going to northbound I-5. The South Sprague Avenue ramp to southbound I-5 is also closed through June. The closures allow crews to rebuild the southbound collector/distributor lane that runs between eastbound State Route 16 and southbound I-5, and the South 38th Street ramps. Signed detours will be in place. Description: This project is the final of a three stage effort to rebuild the Nalley Valley interchange. 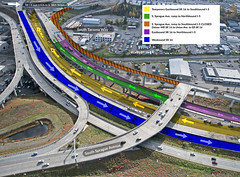 During the final phase, crews will build ramps that create new HOV lanes between I-5 and SR 16. The project will also realign I-5 to accommodate HOV ramps. Description: This project is the final funded HOV project that builds a new southbound I-5 bridge across the Puyallup River and rebuilds the L Street overpass, and widens I-5 to install and complete the HOV system on I-5 in Tacoma. Portland Avenue/27th Street on-ramp to southbound I-5 will close from 10 p.m. to 5 a.m. Tuesday. Two lanes of southbound I-5 will close between Port of Tacoma Road to McKinley Way from 11 p.m. to 6 a.m. Tuesday. Two lanes of northbound I-5 will close from McKinley Way to 28th Street from 11:30 p.m. to 3:30 a.m. Tuesday. Portland Avenue/27th Street on-ramp to southbound I-5 will close from 10 p.m. to 5 a.m. Wednesday. Two lanes of southbound I-5 will close between Port of Tacoma Road to McKinley Way from 11 p.m. to 6 a.m. Wednesday. Two lanes of northbound I-5 will close from McKinley Way to 28th Street from 11:30 p.m. to 3:30 a.m. Wednesday. Portland Avenue/27th Street on-ramp to southbound I-5 will close from 10 p.m. to 5 a.m. Thursday. Two lanes of southbound I-5 will close between Port of Tacoma Road to McKinley Way from 11 p.m. to 6 a.m. Thursday. Two lanes of northbound I-5 will close from McKinley Way to 28th Street from 11:30 p.m. to 3:30 a.m. Thursday. Portland Avenue/27th Street on-ramp to southbound I-5 will close from 10 p.m. to 5 a.m. Friday. Northbound I-5 ramp to westbound SR 16 will close from 10 p.m. to 5 a.m. Friday. Two lanes of southbound I-5 will close between Port of Tacoma Road to McKinley Way from 11 p.m. to 6 a.m. Friday. Two lanes of northbound I-5 will close from McKinley Way to 28th Street from 11:30 p.m. to 3:30 a.m. Friday. Northbound I-5 ramp to westbound SR 16 will close from 10 p.m. to 7 a.m. Saturday. Southbound I-5 exit to South 38th Street will close from 10 p.m. to 7 a.m. Saturday. Portland Avenue/27th Street on-ramp to southbound I-5 will close from 11:30 p.m. to 7 a.m. Saturday. Two lanes of southbound I-5 will close between Port of Tacoma Road to McKinley Way from 11:59 p.m. to 7 a.m. Saturday. Two lanes of northbound I-5 will close from McKinley Way to 28th Street from 11:59 p.m. to 4:30 a.m. Saturday. Drivers are advised to be prepared for up to three lanes closed on both directions of I-5 from 54th Avenue East in Fife to South 48th Street in Tacoma, and single lane closures on eastbound State Route 16 near South Sprague Avenue. All lanes of southbound I-5 are scheduled to reopen by 6 a.m. during the week, and by 8 a.m. on weekends. All lanes of northbound I-5 are scheduled to reopen by 4 a.m. during the week, and by 7 a.m. on weekends. Why are these closures necessary? On I-5 between Port of Tacoma Road and East L Street, contractor crews are rebuilding the center median for a future traffic shift. Crews are removing the East L Street overpass and associated bridge piers. Contractor crews are building a new alignment for southbound I-5 near the SR 16 interchange. The new alignment makes room for direct connect HOV lanes to be built between the two highways. To do this work, southbound I-5 traffic is shifted onto a temporary alignment. Crews are moving into a new stage of construction that reubilds the eastbound SR 16 collector/distributor lanes to southbound I-5. Crews are refreshing the lane striping as weather allows. Description: WSDOT is rebuilding the interchanges at Thorne Lane and Berkeley Street, and adding general purpose and auxiliary lanes to I-5. Daytime shoulder closures on both directions of I-5 from 9 a.m. to 3 p.m. in the project limits. Overnight single and double lane closures on both directions of I-5 each night from 8:30 p.m. to 4:30 a.m. the following day. No two adjacent ramps will be closed overnight simultaneously. Some work is weather sensitive and could be rescheduled. 41st Division Drive on-ramp to northbound I-5 will close from 10:30 p.m. to 7:30 a.m. Saturday. Northbound I-5 exit to 41st Division Drive will close from 10:30 p.m. to 7:30 a.m. Saturday. Southbound I-5 exit to Berkeley Street will close from 10:30 p.m. to 6:30 a.m. Saturday. Thorne Lane on-ramp to southbound I-5 will close from 10:30 p.m. to 6:30 a.m. Saturday. Northbound I-5 will be reduced to a single lane near 41st Division Drive. Lane closures will begin at 10:30 p.m. with all lanes reopened at 7:30 a.m. Saturday. Southbound I-5 will be reduced to a single lane from Thorne Lane to 41st Division Drive. Lane closures begin at 10:30 p.m. with all lanes reopened at 5:30 a.m. Saturday. Northbound I-5 will be reduced to a single lane near 41st Division Drive. Lane closures begin at 9:30 p.m. with all lanes reopened at 8:30 a.m. Sunday. Northbound I-5 on- and off-ramps at 41st Division Drive will close from 10:30 p.m. to 8:30 a.m. Sunday. Southbound I-5 will be reduced to a single lane from Thorne Lane to 41st Division Drive. Lane closures begin at 10:30 p.m. with all lanes reopened at 8:30 a.m. Sunday. Southbound I-5 exit to Berkeley Street will close from 10:30 p.m. to 8:30 a.m. Sunday. Berkeley Street on-ramp to northbound I-5 will close from 10:30 p.m. to 8:30 a.m. Sunday. Northbound I-5 exit to Thorne Lane will close from 10:30 p.m. to 8:30 a.m. Sunday. Thorne Lane on-ramp to southbound I-5 will close from 9:30 p.m. to 4:30 a.m. Tuesday. Thorne Lane on-ramp to northbound I-5 will close from 8:30 p.m. to 4:30 a.m. Tuesday. Thorne Lane on-ramp to northbound I-5 will close from 8:30 p.m. to 4:30 a.m. Wednesday. Northbound I-5 exit to Thorne Lane will close from 8:30 p.m. to 4:30 a.m. Wednesday. Thorne Lane on-ramp to northbound I-5 will close from 8:30 p.m. to 4:30 a.m. Thursday. 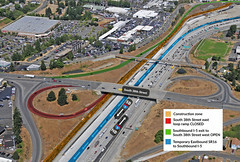 Berkeley Street on-ramp to southbound I-5 will close from 10 p.m. to 4:30 a.m. Friday. Thorne Lane on-ramp to northbound I-5 will close from 9:30 p.m. to 4:30 a.m. Friday. 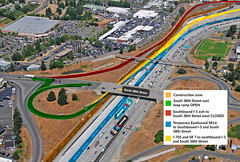 Berkeley Street on-ramp to southbound I-5 will close from 10:30 p.m. to 6:30 a.m. Saturday. Description: Contractor crews are improving pedestrian crossings on State Route 7 in Spanaway and Parkland at six locations. Shoulder closures on both directions of SR 7 from 7a.m. to 5:30 p.m.
milepost 51.57 at 124th Street S.
milepost 50.41 at 143rd Street S.
milepost 49.19 at 162nd Street S.
milepost 48.08 at 180th Street S.
milepost 47.55 at 188th Street S.
Description: Contractor crews will install a temporary crossing over Spiketon Creek in Buckley late summer 2019. The 82-year-old bridge was closed to traffic in August 2018 after settlement was observed in one of its piers. A detour is in effect using Mundy Loss Road, SR 410 and SR 165. Work Schedule: Construction on the temporary crossing will begin late summer 2019. Drivers will continue to use the detour until the bridge reopens later that fall. Project webpage. Description: This project removes and replaces three fish barrier culverts under SR 302 with fish passable structures and repaves nearly 7 miles of highway along with ADA improvements for bicyclists and pedestrians. Work Schedule: During construction, drivers should expect daytime lane and shoulder closures, extended weekend closures, extended on- and off-ramp closures and up to a full, weeklong closure of the Purdy Spit for deck repairs. Project webpage. Description: Contractor crews will repave the roadway surface of SR 507 from Rainier in Thurston County to SR 7 near Spanaway in Pierce County. Daytime drivers can expect to see shifted lanes of traffic. Work Schedule: Railroad repairs each day from 9 a.m. to 5 p.m. Monday through Friday, April 22-26. Description: The City of Tacoma is removing and replacing three spans of the bridge west of the Puyallup River. Work Schedule: The bridge closed to all traffic on May 21, 2018. Check the project web page for the latest reopening date. Description: City of Fife is underway Phase 1 of this project, which brings road, interchange and intersection improvements to the Port of Tacoma. Work Schedule: No ramp closures are scheduled. Description: Replacing the center concrete barrier on both directions of I-5 near South 96th Street. The left lanes will close in both directions at the work zone. Work Schedule: 10:30 p.m. Thursday, April 25 to 5 a.m. Friday, April 26. Description: Guardrail repair on eastbound SR 410 near Traffic Avenue. The Traffic Avenue on-ramp to eastbound SR 410 will close. Description: Jersey wall repair on northbound I-705. Drivers will see the left lane closed. Work Schedule: 10:30 p.m. Tuesday, April 23 to 5 a.m. Wednesday, April 24. Drivers are advised to give themselves extra travel time and become familiar with current ramp closures and detour routes on Interstate 5 in Tacoma before heading out the door. If you're driving at night, please slow down in work zones and avoid distracted driving. Help keep our work crews safe. Slow down, pay attention, and stay calm. Work zones aren't there to personally inconvenience you. They're there to improve the roads for everyone. It's a drivers' own interest to be safe in work zones. Statewide, more than 96 percent of people injured in work zones are drivers, their passengers or passing pedestrians.